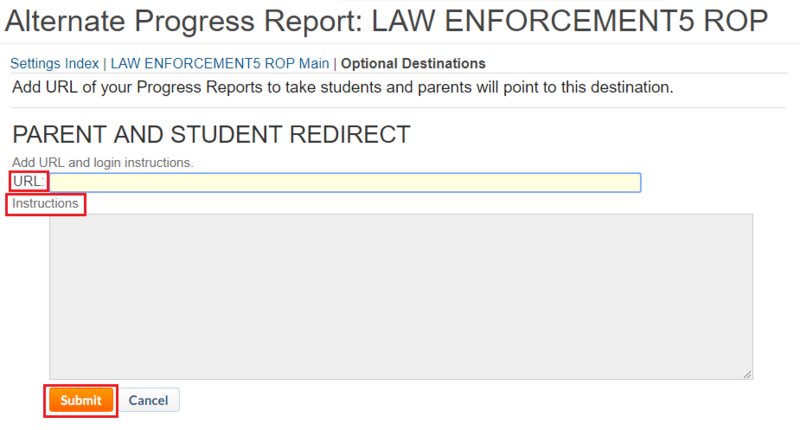 The following steps will guide the user in setting up an alternate progress report that can be provided to students and parents. From your portal click Settings (gear icon) in the top right corner of any page. Choose any course in the Course Settings section. In the Set Alternate Progress Report section, click Go. Enter the URL for your 3rd party Gradebook. You can include a message with instructions on how to log in. If the procedure was performed correctly, students and parents will be able to access the online Gradebook by clicking the Grades link on the Dashboard.